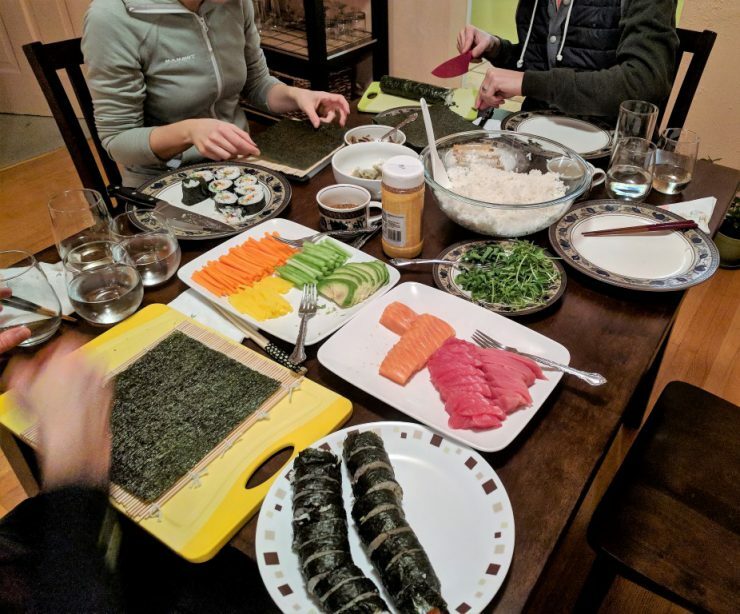 Evan and I recently went to a friend’s house for a dinner party and we made homemade sushi! Our friends did all the prep work: cooking the rice, preparing the fish, cutting up the vegetables. We just helped assemble all of the rolls. It’s surprisingly not too difficult; we added a thin layer of sushi rice on top of seaweed paper, added our choice of fish and vegetables, then used the bamboo mats to form the rolls. If you haven’t tried it before, you definitely should. And if you’re not keen on raw fish, you could always use tofu or just stick with veggies. We had a great time but made way too much sushi! Even though salad isn’t a typical side dish served alongside sushi, I was in the mood to experiment with orzo, so I whipped up a new salad and brought it with to our friend’s house. I used what I had in the fridge: squash, zucchini, and onions, then I mixed in some fresh dill and arugula, and topped it off with toasted pines nuts and goat cheese. The result: a light, flavorful dish that is easily one of my new favorite salads! I’m so glad we had leftovers because I ate all of them. 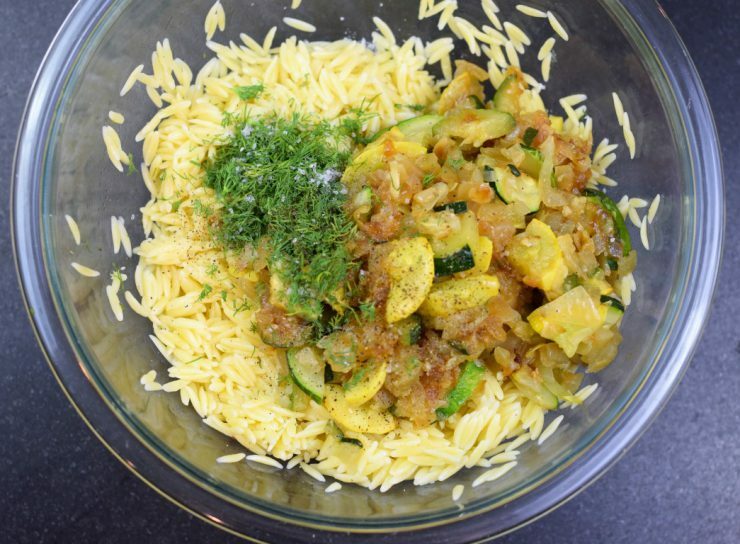 And since then, I’ve made this dish numerous times – it’s so easy to make! Begin by cooking about half of a box of orzo according the package instructions, about 9 minutes until al dente. 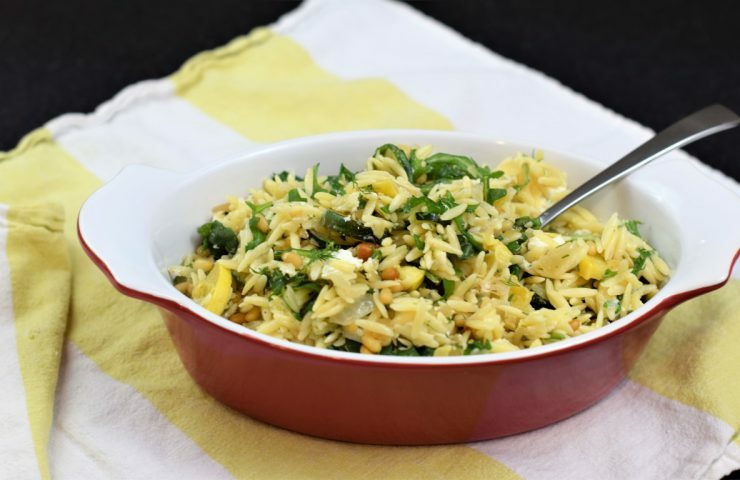 Drain the orzo and add to a medium-sized mixing bowl. Drizzle with a little olive oil, give it a quick stir, then set aside. In a medium-sized skillet, heat about 1 tablespoon of olive oil over medium high heat. 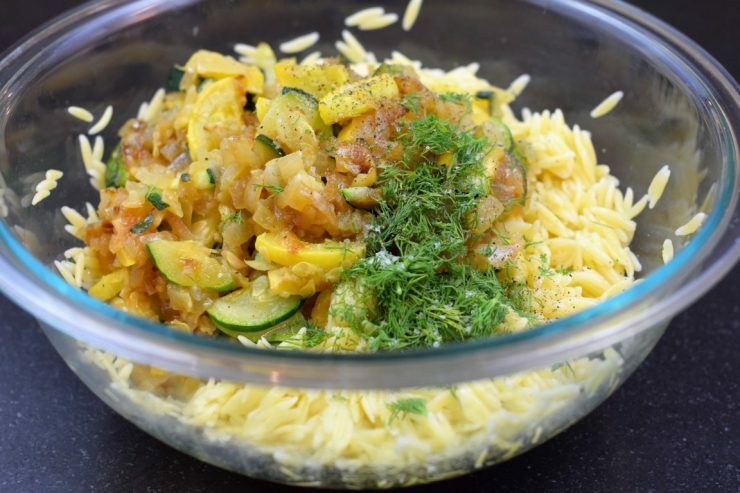 Add the onion, zucchini, and summer squash, and cook about 3 minutes. Then add in the garlic and cook another 3-4 minutes, until the vegetables are fully cooked. 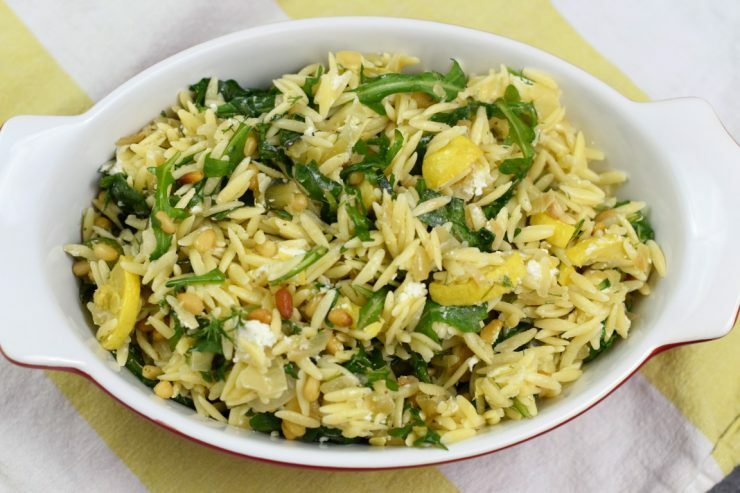 Add the cooked vegetables to the orzo, then toss with the juice of half of a lemon. Mix in fresh dill and arugula. Finally, season with salt and pepper, and fold in goat cheese and toasted pine nuts. To toast pine nuts, preheat the oven to 400 degrees. Place the pine nuts on a baking sheet and bake for 3 to 4 minutes, until the nuts are aromatic and lightly browned. Keep a close eye on them; they toast fast and can easily burn! Refrigerate for at least 30 minutes, then transfer to a serving dish and enjoy! This salad can be stored in the refrigerator for 2 to 3 days, but it’s best served fresh. 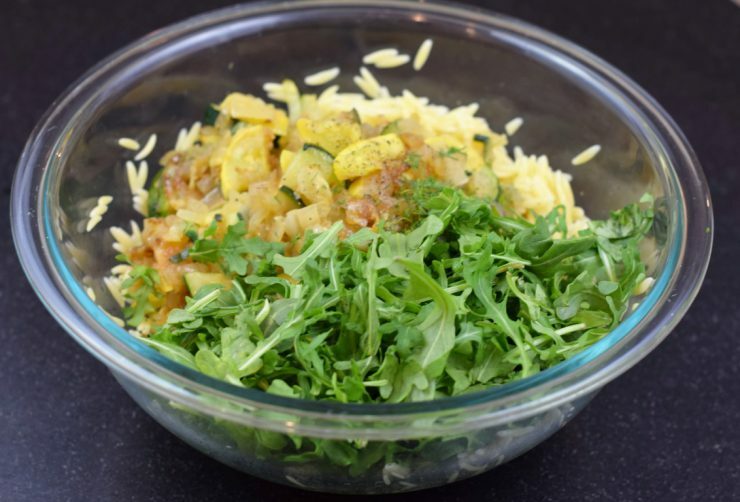 If you want to make it in advance, hold off on adding the arugula until right before serving. You may also need to add in a little extra lemon juice or olive oil if you’re storing it for a few days. Bring a pot of salted water to a boil. Cook orzo according to box instructions (about 9 minutes until al dente). 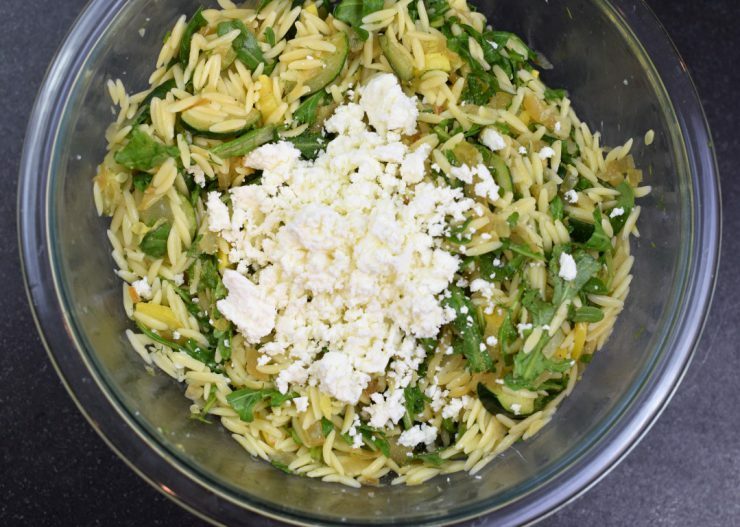 Drain the orzo, then add to a mixing bowl and toss with a bit of olive oil. Set aside and let cool. In a medium sized skillet, heat 1 tablespoon of olive oil over medium high heat. 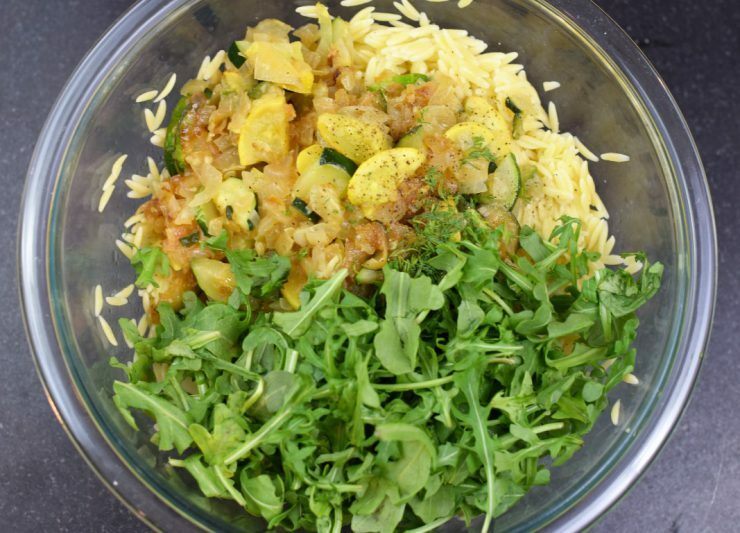 Add in onion, summer squash, and zucchini. Cook about 3 minutes, then add in minced garlic. Cook another 3-4 minutes, until the vegetables are translucent. Add the cooked vegetables to the orzo. 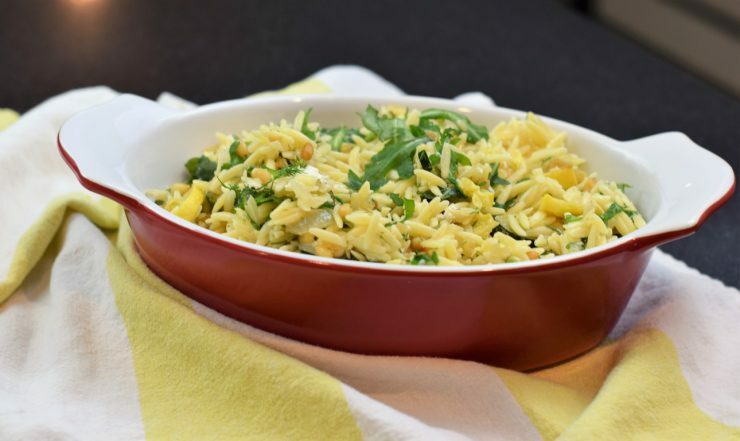 Stir in the lemon juice, fresh dill, arugula, and toasted pine nuts. Season with salt and pepper. Using a fork, break the goat cheese into small pieces and add to the salad, folding in gently. To toast pine nuts, heat oven to 400 degrees. Place pine nuts on a baking sheet and bake for 3 to 4 minutes, until the nuts are aromatic and lightly browned. They toast fast and can easily burn, so keep a close eye on them!